How well do you know the birds that live around your house? A group of birds could be members of a family, or a community of carers, a flock, or a gang of singles. Can you tell which one is the leader or which one is the father, mother, the brother or the sister? Do you know which kid has come for a sleep-over and which one is being wooed? Which is the bird that has just chased off a predator like the cat, or hawk, or snake or even an eagle. How do they help each other stay safe? Birds are some of the most fascinating social creatures that live in the wild around our homes, no matter where we live. Whether you live in an apartment in the city, or have a house in the suburbs or in the countryside, you can enjoy a connection with nature. A good start is providing a bird bath or a feeder, which not only gives the much needed water and nourishment to these wonderful creatures, it brings you joy, beauty and friendship. But much more is possible. 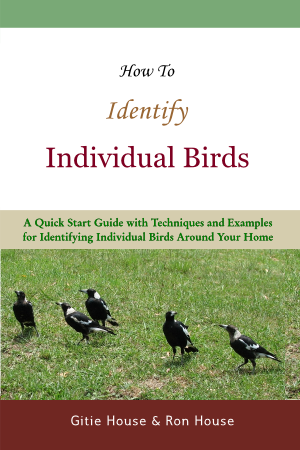 This book teaches you how to observe the birds that visit your yard, balcony or patio, and tell them apart as individuals, so you can deepen your personal relationships with them and understand their lives. Five significant ways of recognizing individual birds are described in detail, with examples and over a hundred original photographs taken by the authors of the birds they know. The authors take you through ways in which you can extend your knowledge about the birds and enhance the joy that comes from building a relationship with them.